Satisfy all of your cravings with this irresistible assortment of snacks. Its delicious mix of sweet and salty favorites make snack time more enjoyable whether it's early in the morning or late in the afternoon. Individual packaging ensures maximum freshness and is great for on-the-go enjoyment. Assorted snacks are perfect for boosting office morale, impressing guests and more. 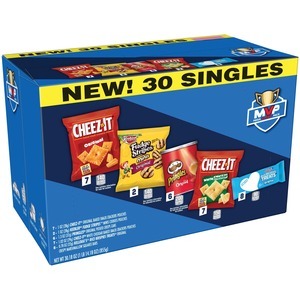 Variety pack includes Cheez-It Original Crackers, Cheez-It White Cheddar Crackers, Keebler Fudge Stripe Cookies, Pringles Potato Crisps and Rice Krispies Treats.